I’m up to my wrists in nukadoko—a squishy, yeasty mulch of rice bran, miso, salted water, seaweed and red peppers—in a class on pickling vegetables at one of Kyoto’s premier pickle purveyors, the 95-year old Kawakatu company. The instructor, Mr. Akazawa, a master of the art of preserving more than a hundred veggies from eggplant to giant radish, explains that only a few decades ago, Japanese housewives routinely prepared their own pickles, but with women’s recent migration to the workplace, more people are purchasing this daily staple of Japanese cuisine. He is actually explaining this all in Japanese, but luckily I have the gracious interpreting services of Tomoko Yoshihara, one of the Kyoto Free Guides — a generous group of volunteers who enjoy practicing their English by kindly taking tourists to visit gardens, temples or tearooms — (Tomoko did say I was the first to ask for pickle making). While my husband is here teaching at a local university for two weeks, I’ve decided that besides admiring the traditional wooden houses which line Kyoto’s charming narrow lanes, I want to appreciate the legendary food of this ancient city, known as “the historical and cultural heart of Japan,” not only by sampling its specialties, but by learning how to make a few of them. After salting the daikon, cabbage, eggplant and cucumber, I bury them in my tub of rice bran* mush, as directed by Mr. Akazawa. He tells me that once I take my container home, I should keep it covered, mix up the nukadoko everyday and specifies how long to wait before each veggie will be properly pickled. The problem, I realize, is that the tub weighs over 10 pounds and there is no way I can lug it around on the bus all day. Tomoko and I have another class scheduled for the afternoon in wagashi (sweet) making. No problem, says Mr. Akazawa, Kawakatu will be happy to deliver the tub of pickles to my door tomorrow morning — and they do. Like so much in Kyoto, from white-gloved drivers in immaculate taxis with lace covered headrests to super helpful subway station agents, exceptional service is part of the cultural landscape. Since Kyoto’s climate makes it an ideal vegetable growing center and home to carrots and radishes only cultivated in this region, its pickles are particularly prized — an item that Japanese visitors from other parts of the country often bring back as souvenirs. I taste a host of other Kyoto specialties in coming days, including yuba, paper-thin, dried, soybean milk skin and a rainbow of exquisitely shaped sweets made with rice flour mochi. It’s springtime, so the sweets, reflecting the Japanese reverence for nature, take the form of flowers, young green leaves and cherry blossoms. In the wagashi making class, we learn how to encase a marble of red bean paste with pearly white mochi to make a smooth globe (it’s harder than it looks). Pressing the ball with a spiral form leaves a circular imprint that we accent with a tiny pink petal. Tomoko tells me this represents a fallen cherry blossom in a pool of water. We sample our sweets the traditional way: with a bowl of matcha green tea. We stop for a snack of flavored fish paste on a stick that comes in a variety of flavors. Ririko gets ginger. My sweet potato pop is yummy. Still feeling hungry, we head to a restaurant where we mix up and then cook our lunch of okonomiyaki on a hot grill. It’s a thick pancake made of cabbage, egg, ginger, green onions, flour and your choice of meat. After lunch, Ririko and I take the old-fashioned Randem tram to a little soba shop run by Mr. Umehara, who provides a lesson in making these popular buckwheat noodles. Although Ririko is a fine interpreter, the young soba chef and I find that words are not really necessary, as I attempt to copy his movements mixing, kneading and rolling out the stiff dough. He charmingly resorts to drawing in the flour to explain that my circle needs to become a square and then a long rectangle. Not surprisingly, the rolling requires a lot of muscle. The hardest part is cutting the noodles into uniform skinny strips with a huge, heavy knife, an art that I gather takes months or years to master. After my labors, Ririko and I enjoy a plate of cold cooked soba noodles that we dip into a tangy sauce enlivened with wasabi and green onions. Then Mr. Umehara brings over a pitcher of milky water. Ririko explains that this is yu, the cooking liquid from the soba noodles. We pour a generous amount into our dipping sauce bowls and the resulting soup is the perfect capper to our afternoon soba snack. Another day, I venture out on my own to the food floor of Daimaru department store, where the selection is overwhelming: dozens of gorgeous salads, pastries, fried vegetables, again with plenty of tastes. The lovely thing about lunching in this living food museum is that a foreign visitor doesn’t need to struggle with a menu—just point. For my last food adventure, I’ve lined up a cooking class given by Emi Hirayama in her home kitchen. She usually teaches 3-4 students at a time, but the other couple scheduled to attend got sick so I have the delightful Emi all to myself. In 3 hours we make and eat 5 different dishes that highlight spring flavors, such as prawn and sugar snap salad with white miso dressing and grilled sea bream. Emi has prepared ingredients in a dozen little bowls spread across her kitchen table and puts me to work grating a Japanese yam that becomes a sticky jelly, deboning fish and chopping sansho pepper leaves. This accomplished cook also introduces me to 3 kinds of miso, mugwort and black sesame flavored fu (wheat gluten) and explains why the sea bream is considered a lucky fish (its name in Japanese is a pun on the word for “celebrate”). Although Emi’s English is very good, as she maneuvers around her cozy kitchen pulling out a multitude of dishes to hold the many elements of the meal, she endearingly murmurs to herself in Japanese (as I know I do in English, trying to keep my place in a complicated recipe). She emphasizes presentation, so we make “little mountains” of the peas and prawns. We end the meal with tiny glasses of plum wine that she has—of course—made herself and clink our glasses with a toast: Kanpai! On our last night in Kyoto, my husband takes me to a cozy little restaurant called Ja Doo. Chef Kiyokazu Kimura serves us omakase style – no menu, just his original creations for the evening. Welcoming us, he invites us to sit at the counter next to a friendly woman named Keiko, who speaks fluent English. 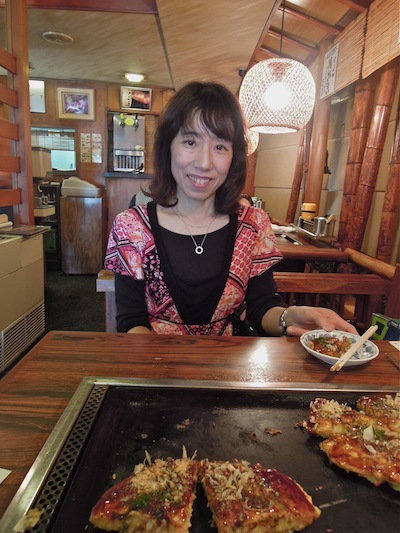 She explains that the cooking here is sosaku-ryori (or a fusion of Japanese and European cooking styles). The chef starts us out with a trio of dainty appetizers: cucumbers, squid and eggplant. After several cups of sake for us (and beer for her), Keiko tells us that she is actually the chef’s ex-wife, but that she visits often — “he makes the best soba!” — and that they have remained friends. The chef moves us on to a tiny tofu and cheese tidbit, chicken stew, sweet pork with crunchy vegetables, and a meltingly tender fish cooked in paper. After more sake and beer, we discover that we each have 20-year old daughters who are artists. 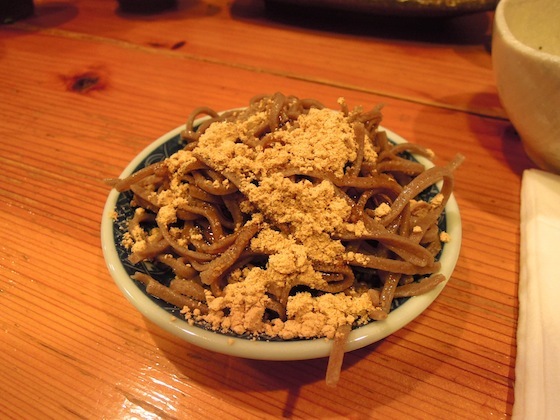 The chef ends with a petite bowl of sweetened soba for dessert. Every dish is a tasty surprise, since we never know what’s coming next. Keiko is a delightful dinner companion and finally when the chef asks my husband’s age and finds out that they are both 60, it totally cements our bond. The meal marks the perfect end to my food forays in this lovely city. And so I toast Tomoko, Ririko, Emi, Keiko, Kimu-chan and Kyoto for the gift of these culinary adventures— Kanpai! * All the ingredients–including rice bran–needed to make pickles the Japanese way are available at Berkeley’s Tokyo Fish Market. Their gift store also carries Japanese cookbooks. I have the Tsukemono book by Ikuko Hisamatsu, with helpful step-by-step pictures. I wrote a post last year about making easy pickles with vinegar, but now I am braver and will try the ones with rice bran. This entry was posted in Japan, Japanese food and tagged cooking classes, Japanese pickles, Kyoto, Kyoto Free Guides, pickle making, pickling vegetables, soba noodles, wagashi. Bookmark the permalink. Although it is probably out of print, you should get a copy of Kay Shimizu’s “Japanese Pickled Vegetables” (Shufunotomo/Japan Publications 1993). The Berkeley Public Library has a copy. Ms Shimizu was living in Saratoga when she wrote this book. Her recipes are geared to ingredients available in the Bay Area. Thanks, Tak. I will definitely check that out. 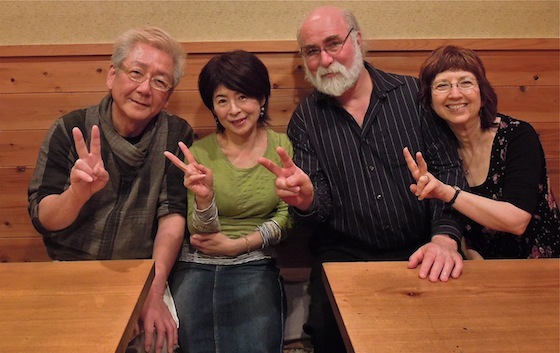 Thanks, I loved it when I was in Kyoto, this blog is just amazing! I just published an article about the best cultural classes in Kyoto, and the ones you documented here look great too. 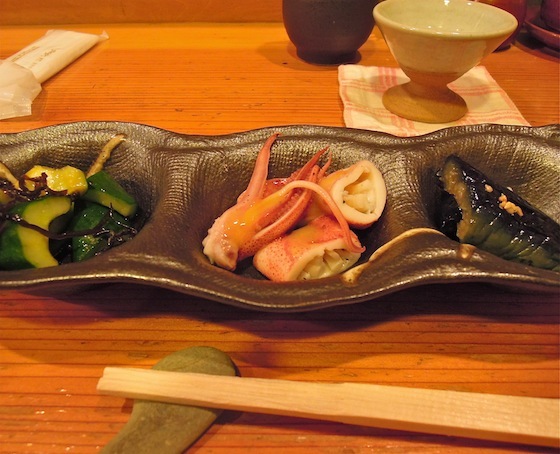 I had no idea Japanese pickles were a delicacy, I should have tried some when I was there. Same for the petite bowl of sweet soba, that sounds yummy. I’m especially appreciative that you mentioned the ‘Kyoto Free Guides’ who volunteer taking tourists around to practice their English. Great travel tip, thank you. I think taking cultural classes is a great way to travel and learn. I have mostly focus on food-tours and cooking but you are inspiring me to branch out. I find people are very kind when you show that you are interested in learning about their culture. Nice blog you have too! I’d love to find out the location and contact information for Mr. Umehara’s soba shop. My husband and I are going to Kyoto this October and it would be a great adventure for us to learn how to make soba noodles. Sorry, I heard he is no longer there. Hope you have a great trip anyway.